"Saudis have moved into the product business in a big way," said Fereidun Fesharaki of FGE Energy. With Saudi Arabia's refined fuel contributing to the global supply glut, what will be its impact on the refining markets especially those in Asia? How will Saudi Arabia Capture Market Share Downstream? A refinery's success is measured by its ‘gross refining margins'. The gross refining margin is nothing but the difference between the value of the refined products and price of the crude oil. In case of Saudi Arabia, the price of crude oil would be extremely low. "The crude is so cheap it's pretty much free for them, the margins are going to be massive. It makes trade flows in products very different," said Amrita Sen of Energy Aspects. 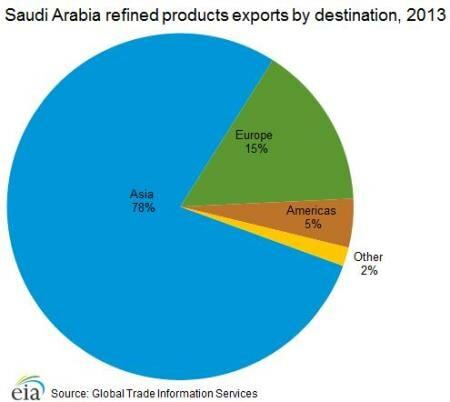 There is little doubt then as to why the Saudis are shifting their focus to domestic refining. Along with acquiring a controlling stake in Korea's S- Oil, the desert kingdom is commissioning a new refinery in Jizan which would have a capacity of around 400,000 barrels per day when it begins operations in 2017. Jizan will come on top of Saudi Arabia's two other 400,000 bpd- refineries at Yasref and Yanbu, and will turn the country into a major global player in the downstream sector, expanding its campaign for market share beyond just crude oil. Is Saudi Arabia likely to win a potential price war against Asian producers of diesel? By offering almost 2.8 million barrels of low-sulphur diesel to Asian and European markets, the Saudis are directly competing with Asian refiners, potentially sparking a price war. In fact, at $5.60 the Asian refining margins have fallen by almost 50 percent from June this year and are expected to drop by a further 30 percent. "We see refining margins weakening on worsening diesel fundamentals, particularly east of Suez, though gasoline should be supportive. A lot of diesel will be trapped in the Far East and this will lead to run cuts in places like Japan and South Korea as the arbitrage to the west will be closed by growing Middle Eastern supplies" said Robert Campbell of Energy Aspects. On the other hand, it won't be easy for Saudi Arabia – Chinese refiners are also producing more gasoline, for which demand is still strong. Moreover, Indian refiners are now moving away from Saudi Arabia which was previously India's largest crude oil supplier. Indian refiners are now buying more crude oil from Nigeria, Iraq, Venezuela and Mexico. As a result, Saudi Arabia was forced to offer discounts on its heavy and sour grade of crude oil to its Asian customers. Still, Saudi Arabia can likely wait out the competition. Just as they have kept their crude oil production levels intact, it is possible that the Saudis will maintain their current refining output in spite of falling refining margins and eventually end up winning the price war against Asian producers. However, one cannot easily neglect the Indian and Chinese refiners. Let us consider the case of Indian private refiners Essar and Reliance, which are among the most complex refineries in the world (refineries which are capable of processing heavier and cheaper crude). These two refineries have seen great success recently, following the recent dip in oil prices after a deal was reached between the P5+1 and Iran, and are likely to build upon their already impressive refining margins (Gross refining margin for Essar refinery was $9.04 per barrel while that of Reliance was $8.70 per barrel in first quarter of 2015). So, who will reap the benefits of the low prices? Given current market conditions, the Asian demand for diesel has reduced mainly due to the weakening Chinese market, while demand for gasoline is increasing in India, Pakistan, Thailand, the Philippines and Vietnam. The price for diesel is expected to fall, and gasoline prices will also continue to fall if there are no run cuts in the Asian refineries. This all translates into lower prices of refined fuels will eventually benefit Asian customers who will pay less for transportation, basic commodities and essential services.